How to draft a Client Contact List? An easy way to start completing your document is to download this Client Contact List template now! Instead, we provide this standardized Client Contact List template with text and formatting as a starting point to help professionalize the way you are working. Our private, business and legal document templates are regularly screened by professionals. If time or quality is of the essence, this ready-made template can help you to save time and to focus on the topics that really matter! Download this Client Contact List template now for your own benefit! 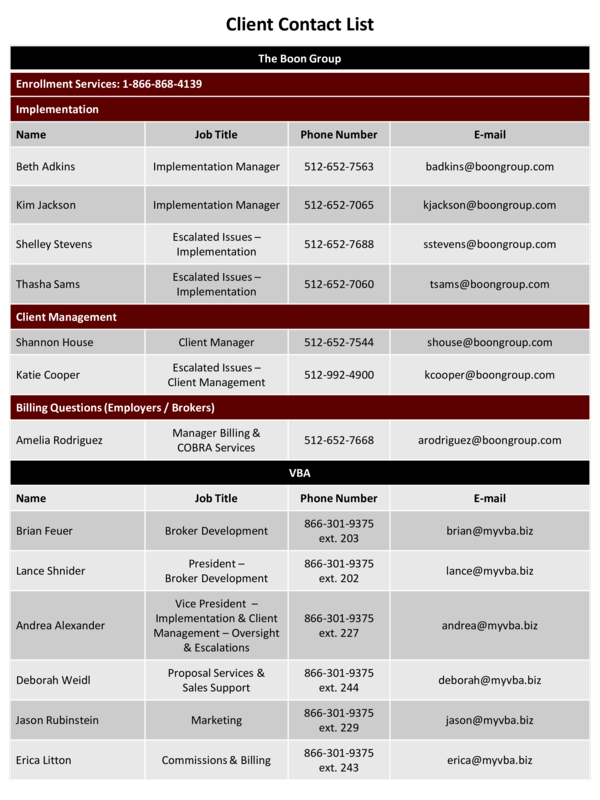 Client Contact List The Boon Group Enrollment Services: 1-866-868-4139 Implementation Name Job Title Phone Number E-mail Beth Adkins Implementation Manager 512-652-7563 badkins boongroup.com Kim Jackson Implementation Manager 512-652-7065 kjackson boongroup.com Shelley Stevens Escalated Issues – Implementation 512-652-7688 sstevens boongroup.com Thasha Sams Escalated Issues – Implementation 512-652-7060 tsams boongroup.com Client Manager 512-652-7544 shouse boongroup.com Escalated Issues – Client Management 512-992-4900 kcooper boongroup.com 512-652-7668 arodriguez boongroup.com Client Management Shannon House Katie Cooper Billing Questions (Employers / Brokers) Amelia Rodriguez Manager Billing COBRA Services VBA Name Job Title Phone Number E-mail Brian Feuer Broker Development 866-301-9375 ext..